The DEO captures Purity - the second of the Kryptonian Worldkillers, but Kara and Alex have very different ideas about how to approach her. Meanwhile, J'onn and Winn assist Mon-El in repairing the Legion of Super Heroes ship. The scene between David Harewood and Chris Wood as they discuss marriage and secrets is a great bit of work for both actors. The effects work for Purity's powers are good. In the New 52 Supergirl comic, The Worldkillers were a group of genetically engineered creatures designed by Kryptonian scientists (overseen by Zor-El) using embryos from other species to create living biological weapons capable of destroying a planet. Reign was one of the Worldkillers and the first that Supergirl encountered. Five total Worldkillers survived the destruction of Krypton. None of the Worldkillers in the comics were named Purity or Pestilence. Reign was the leader of a group of four of the Worldkillers. She possessed enhanced strength, durability, speed and endurance on par with Supergirl as well as the power to fly. She was also a master of hand-to-hand combat.and sword fighting. The cat-like Deimax was the second Worldkiller in Reign's team. She had the claws and fangs of a tiger as well as enhanced strength and durability. Flower Of Heaven was the third member of Reign's team. This insectoid being had the power of flight as well as energy absorption and projection powers. Her purpose was reportedly to attack a planet by overloading planetary systems. The final member of Reign's team was the reptilian Perrilus. Possessing the same enhanced strength, speed, endurance and flight powers as Reign. She also had the power to generate poisons and viruses within her body, enabling her to kill whole populations by passing among them. Purity's displayed powers include a sonic scream akin to that of Black Canary/Black Siren and the ability to generate localize earthquakes, presumably though some kind of sonic manipulation. She is also telepathic, claiming to be able to see inside people - a power she proves when she taunts Alex with information about her break-up with Maggie Sawyer. She is also able to fly and is invulnerable enough to break glass with her body and not be harmed. She is also strong enough to wrestle with Supergirl and come close to strangling her. Kryptonian cache crystals are used to store sensitive information. Each crystal has a signature of sorts, being composed of the same materials unique to the place that make it, like an artist's stamp. The crystal Purity had possessed a different signature than the cache crystals of the Fortress of Solitude. The vibrations given off by Purity's powers are tuned to specifically hurt Kryptonians. Moran Batteries are used to generate anti-gravitational fields. The Legion of Super Heroes ship has five power sources, including one Moran Battery. Martian moonshine has a consciousness-enhancing quality to it and a spicy flavor. Winn alters some old DEO technology to generate a counter-frequency that should protect the DEO team from Purity's sonic blasts. It does nothing, unfortunately, to counter area effects, so Purity is able too destroy the floor and support beams around her when cornered in the subway station. Measurements in Moran math are based on a scale of 12 rather than 10. When Mon-El was attempting to use J'onn's Moran battery to jump-start the Legion's, they were over-loading it due to the discrepancy based on using the 10 scale instead of the proper 12 scale. Alex: We can try it your way. Alex: And when your way fails, we try it mine. Sam: Sound like a plan? Sam: You get precisely one, "Hell, yes" today. I hope you enjoyed that. Purity: The three will walk across the land. And the blood of the weak will water the new world. Supergirl: Rao defies you! I defy you! And I will bring you low! Mon-El: But with Kara, I mean... (chuckles) There was... there was nothing logical about falling in love with Kara. I mean, she was a Kryptonian... elitist and I was this completely self-absorbed misogynist. Not anymore. But what I felt for her... it was just.. (pauses) Being back here is, um. ...I've had to keep a distance from Kara. Because whenever I'm around her, these old feelings get stirred up. And then I have to hide it from Imra. But lately, there's been all this friction between us, cause of... I know it's my fault and I just... I don't know what to do. J'onn: You know... if you think keeping secrets from your wife is hard, you should try keeping secrets from a Martian. J'onn: My wife and I would uh... would bond and literally share our thoughts and feelings every night. Marriage is sharing, Mon-El. Everything. You are not a criminal because you have complicated feelings. If you truly love and honor, Imra, maybe you should let her in? Kara: I am used to you being pragmatic, but since when have you become so hard and cynical? Alex: Well, not all of us are bulletproof, Kara. Alex: So cynicism, that's what's keeping the rest of us alive! Kara: It seems like it's killing you. Purity's powers activate after she feels threatened by Alex Danvers. Lena orders Sam to take a day off. Winn finds a Kryptonian cache crystal in Purity's home. The mileage on J'onn's starship is 700 million miles. Winn is a car guy. Julia Freeman was adopted in 1993 by Lawrence and Molly Freeman. She is allergic to milk and studied music at the Cincinnati Conservatory. Purity claims that Julia Freeman was just a role that she played and that there is not a "real" Julia. Later, she admits that she was lying as she strangles Kara, saying that she is going to make Julia watch Supergirl die. Vinita Ripson was Julia Freeman's roomate at the conservatory and is her best friend and emergency contact. Kara refers to the events of 311, where Julia saved Vinita's life by pushing her out of the way of a car. When Purity's cache crystal activates, it sends a signal of some kind to Reign. It also generates a power surge that shorts out the power dampeners in her cell at the DEO. J'onn was married for 77 years. Mon-El tells J'onn that his marriage to Saturn Girl was arranged - a political wedding to unite two warring factions of planets in the early days of The Legion of Super Heroes. Saturn Girl comes from an important family on Titan, one of Saturn's moons. Titan led a faction of planets that were opposed to Earth and its allied worlds. Mon-El says that he grew to love Saturn Girl after being friends and partners with her for a time in The Legion but that what he feels for Kara is threatening that. Martian spouses would bond and share their thoughts and feelings every evening. Ruby tells Lena about Sam's missing time, lost memories and disappearing. Julia goes with Reign willingly to save Alex's life. Mon-El says he isn't sure if he is still in love with Kara or not. Saturn Girl fell in love with Mon-El because he was so honest. Saturn Girl and Brainiac-5 had another reason for returning to the past that was kept secret from Mon-El. Sam has a black-out in front of Lena, briefly becoming Reign when she is angry at Lena telling Ruby about her illness. Lena says she knows what is wrong with Sam but that she can fix it. Alex's sudden refusal to believe in Kara's ability to appeal to people's better angels is forced only so there is some kind of conflict regarding the treatment of Purity. 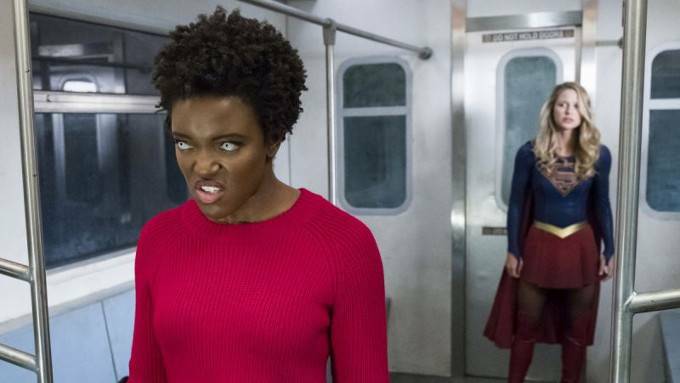 Up until the halfway point, this episode is painful, with Kara and Alex written as parodies of themselves and Purity being the typical gloating villain. Then we get to the J'onn/Mon-El bonding scene and somehow, the episode turns around. Every character moment afterward is good enough to forgive the bad that came before and the final ten minutes is magic. It's aggravating, however, that we have two major bombshells dropped just before the show goes on hiatus for a few months. And you know this episode must have been amazing because Legends of Tomorrow is my favorite CW show right now and I've been anxiously awaiting John Constantine's return, yet I would delay it's return just to know what The Legion's real mission in the past is and what Lena has figured out about The Worldkillers.